Ciccioli are the crispy, rendered residual pieces of leftover from the butchering of an animal, typically pork or goose, when making lard. Store: They can be kept for a long time. Prepare: These are best eaten hot. Eat: Ciccioli are used in dishes in Emilia, Lazio, and Campania. 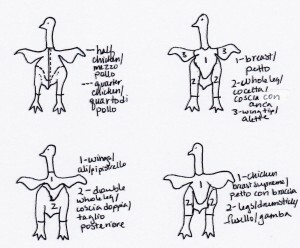 Goose scratchings are eaten in Lombardia. They can be eaten on their own as a starter or with an aperitif. 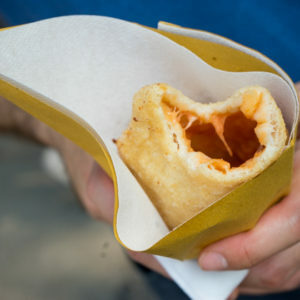 They can also be used in omelettes, savoury pies, in polenta (polenta e ciccioli), on focaccia and breads (pizza con ciccioli, migliaccio campano, and pane con i cicoli), or in dishes such as cicciolata di Parma. Pancetta is cured pork belly characterised by alternating layers of pork fat and meat. It is same cut as streaky bacon, also known as American bacon, but it is cured differently. 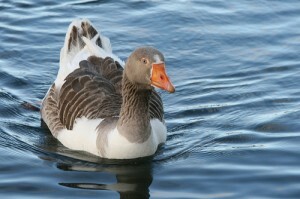 It can be brined or dry-salted and sometimes smoked. 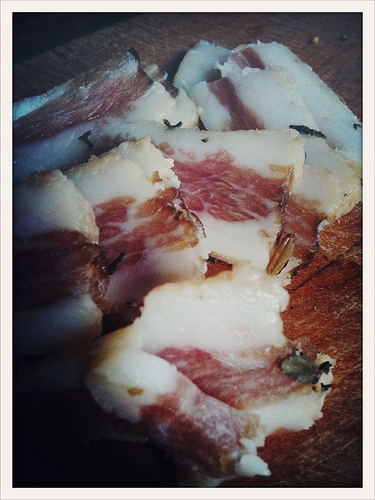 Buy: Pancetta is available with or without the rind, natural, aged, or smoked. The most common is the flat pancetta (pancetta tesa). 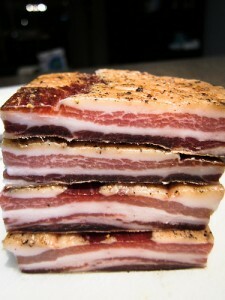 Flat pancetta (Pancetta tesa) is flat like American streaky bacon. It is cured for between three weeks to two months. 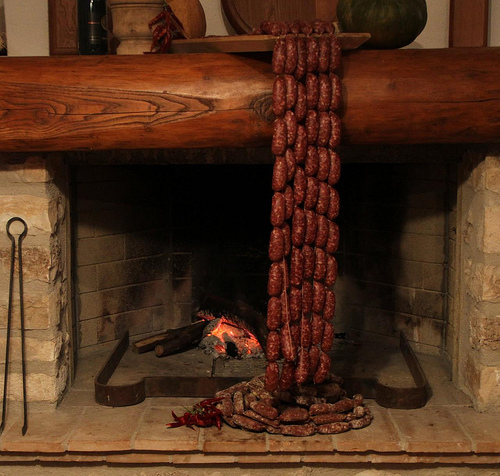 In Alto-Adige, Friuli, and Valle d’Aosta it is sometimes smoked (pancetta affumicata). 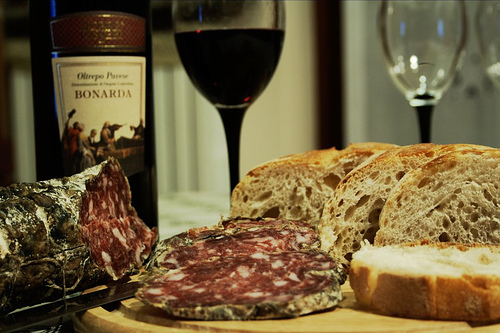 Prized varieties include the rectangular pancetta di Calabria PDO, sometimes coated in powdered chilli, and pancetta tesa lucana from Basilicata. Rolled pancetta (Pancetta arrotolata) is rolled and made from the leaner parts of the pork belly. It is flavoured with pepper and cloves. Prized types include pancetta piacentina from Emilia and Lombardia and pancetta arrotolata dei Monti Nebrodi from Sicilia. Lean pancetta (Pancetta linea / Rigatino) is a lean pancetta from Toscana. Store: Pancetta can be kept in the refrigerator in an unopened package for two weeks or in an opened but sealed package for one week. It can also be frozen for up to a month. Prepare: If the pancetta has a rind, you may want to cut this off. 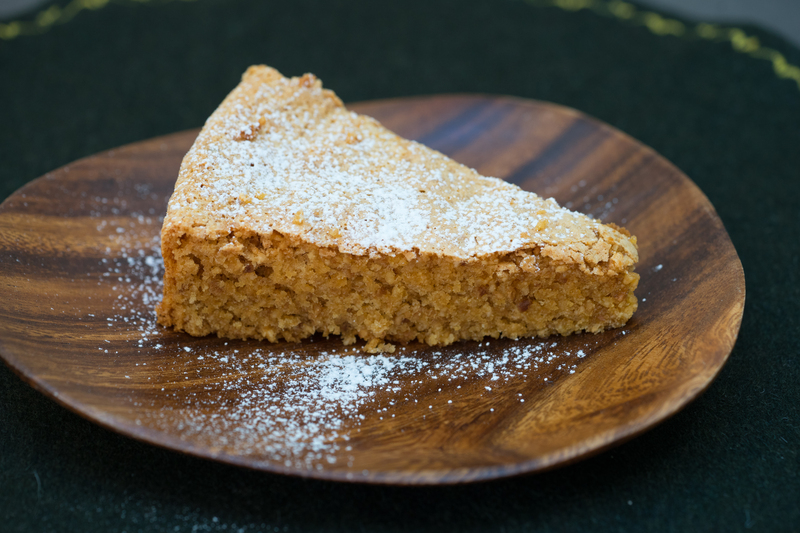 Otherwise, no special preparation is necessary aside from slicing or chopping it according to the recipe. Eat: Pancetta tesa is used in soffritto or battuto (a mixture of chopped pancetta, onion, carrot, and celery which is used as the base of many dishes), pasta sauces (carbonara), kebabs (spiedini). It is also pounded or chopped with garlic and herbs and pan-fried to form a base for some dishes or to flavour soups or stews. 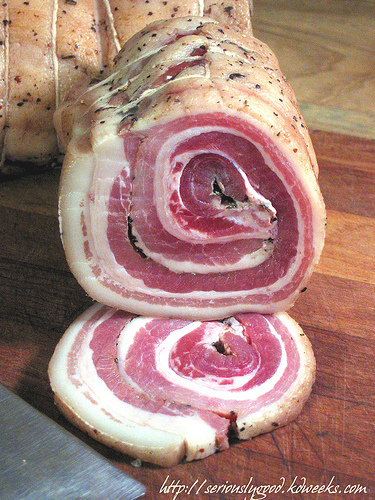 Pancetta arrotolata is used in stuffings or served uncooked with other cured meats. There is also pancetta coppata where the pancetta is wrapped around the pig’s cervical muscle and flavoured with spices. 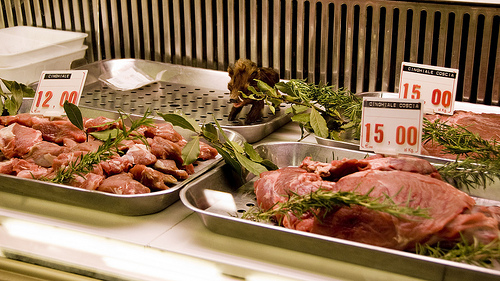 In Italy, domesticated pork and wild boar (cinghiale – See Wild Boar) are eaten. 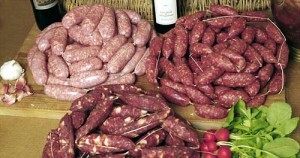 It is the most used meat in making salami, sausages, prosciutto and other cured meat products. No part of the pig goes unused. The skin is made into pork rinds (cotenne / cotiche). 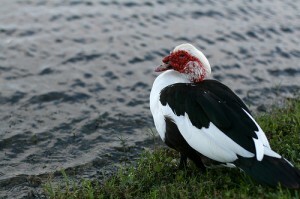 The blood (sangue) is used in sanguinaccio and migliaccio and can be fried. The head (testa) is made into coppa di testa and the cheek made into guanciale. The belly is made into pancetta. 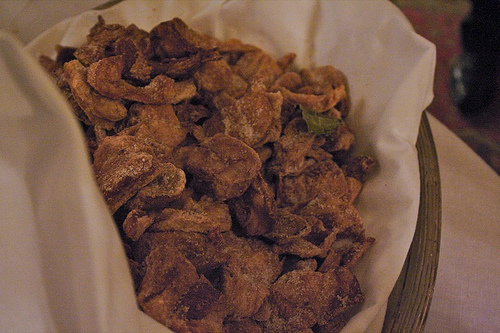 The fat is used as lard (strutto) and lardo, while what is leftover after making the lard is made into pork scratchings (ciccioli) – see Pork Scratchings below. 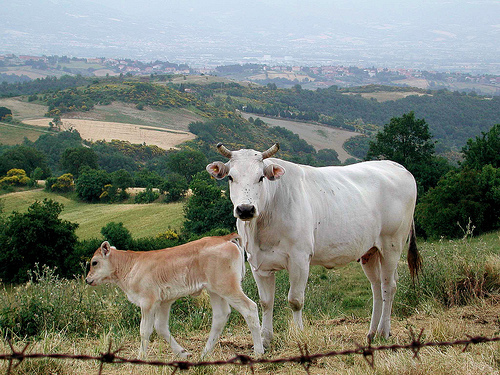 Native breeds of pig in Italy include cinta senese (Toscana), suino di razza mora romagnola (Emilia-Romagna), suino pesante (Emilia-Romagna), razza casertana (Campania), and maiale nero (Calabria). Buy: Pigs raised for their meat are normally more than 8 weeks old and can weigh up to 150 kilos. There is also suckling pig (maialino), which is four to eight weeks old. Look for meat which has a good proportion of lean meat to fat. 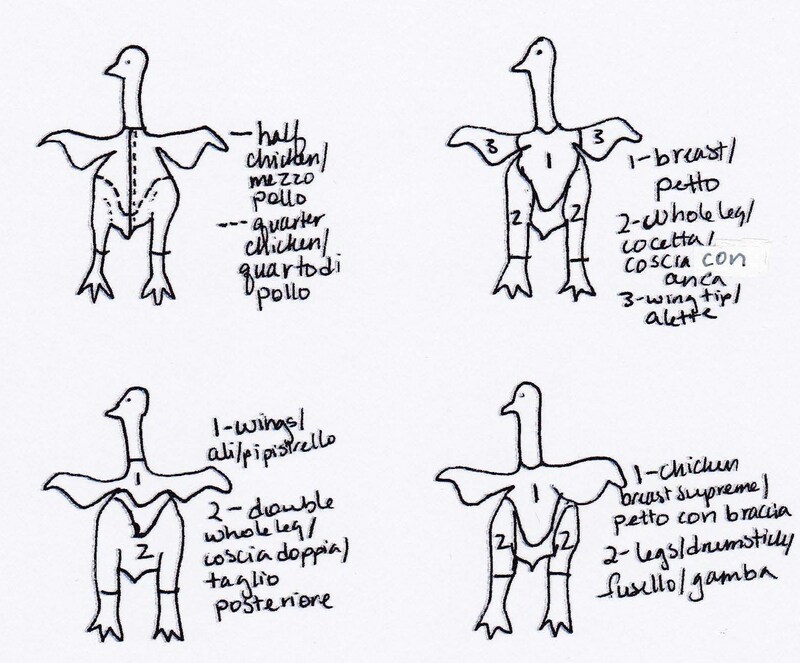 The meat should be pale in colour (not deep rose coloured) and have pliable bones with a soft skin. Brittle bones and rough skin are a sign that the pig was too old. The meat should be free of brown or yellow stains on the skin. 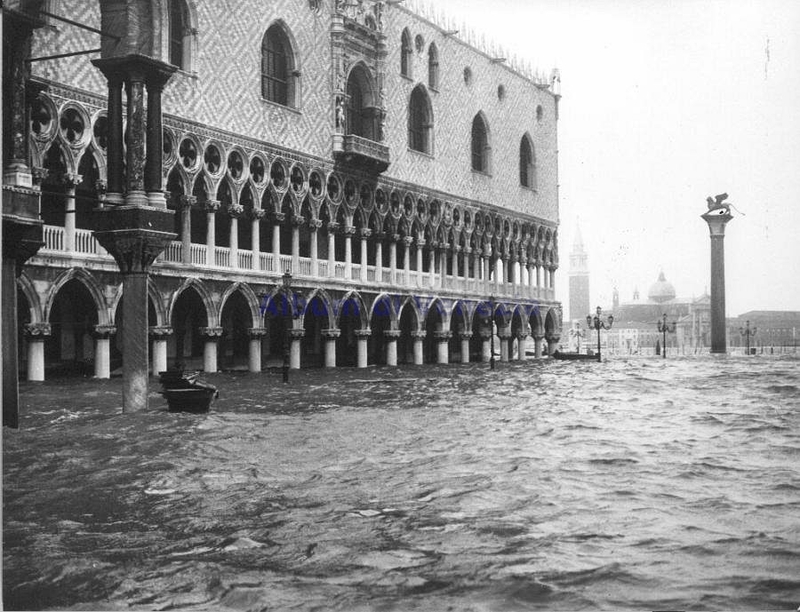 It should be damp but not wet or slippery. If there is any smell to the pork, it is past its prime. Free-range pork has a better texture and flavour. 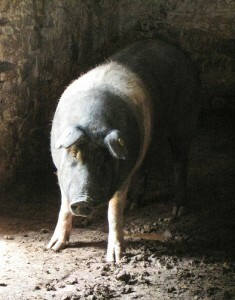 When selecting a suckling pig, choose one which is 5 to 6 kilos in weight as it will have developed some flesh but will still be tender. Store: Pork should be wrapped and stored in the refrigerator at 5˚C on a tray to catch any drips. 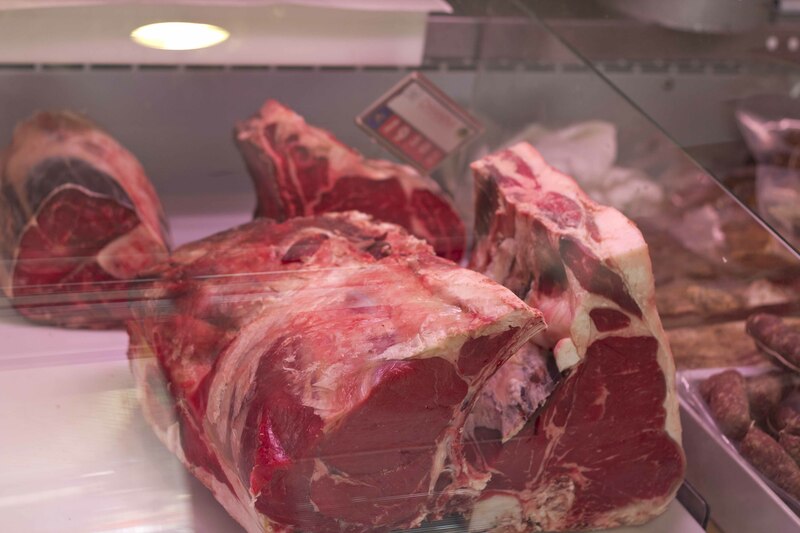 Meat should be unwrapped and stored, lightly wrapped in parchment paper or aluminium foil in the refrigerator as an airtight container may promote bacterial growth. It should be stored on the bottom shelf of the refrigerator so it doesn’t contaminate other food. Pork mince and sausages can be kept in the refrigerator for 1 to 2 days. Pork joints and chops can be kept in the refrigerator for 3 to 5 days. If your time requirement is longer than this then the pork can be frozen in thick airtight freezer bags at – 18˚C and then thawed in the refrigerator (6 to 7 hours per 450 gms) or in a sealed bag immersed in cold water when needed. Pork mince can be kept in the freezer for 3 to 4 months. 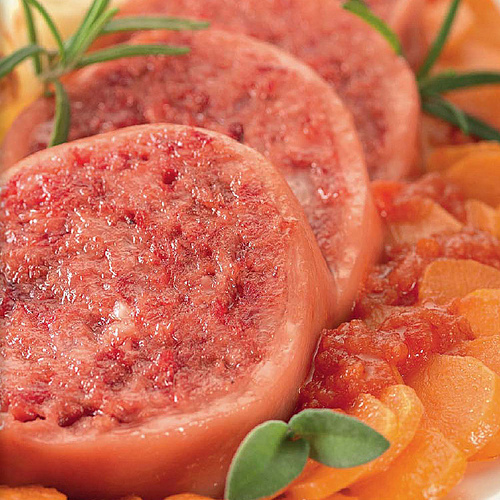 Pork sausages can be kept in the freezer for 1 to 2 months. 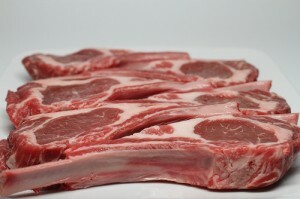 Pork joints and chops can be kept in the freezer for 4 to 6 months. If the meat begins to show signs of grey, white or brown patches on the meat, it is developing freezer burn and is dehydrating. It is still edible but will be dry and not taste nice. 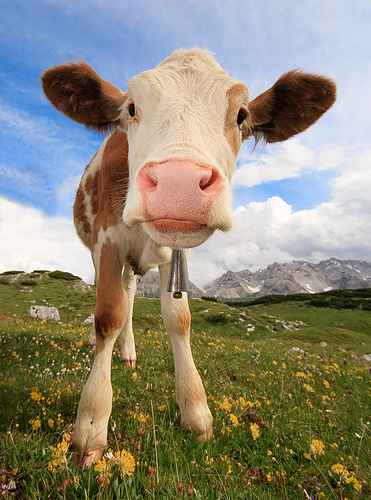 Organ meats are more highly perishable and should be consumed within a week of slaughter or purchased frozen. 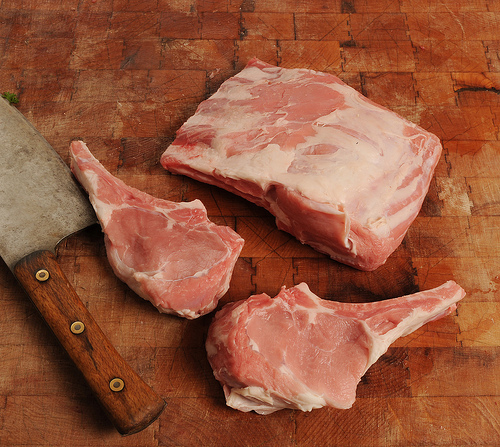 Prepare: Pork should be cooked medium to 60˚C so that the meat is not pink but still juicy. Pork is finished cooking if the juices run clear. Do not allow the fat to come out of the meat (the fat is white and coagulates). If pork is overcooked, it becomes dry and tough. If it is undercooked, there is a risk of contracting trichinosis, a parasite. To roast pork, heat the oven to 180˚C, score the skin to the fat and roast for 25 minutes per 450 grams. To braise pork, simmer with aromatics over medium heat or cover and bake at 170˚C in the oven. 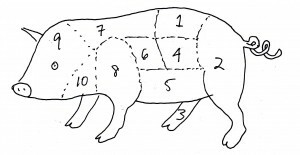 To roast or spit-roast a 5-6 kilo suckling pig, prick the skin before and during roasting and cook for 20 minutes per 450 grams at 180˚C. Eat: Pork can be roasted (arista, maiale arrosto all’ acqua, maiale arrosto all’uso di Reggio-Emilia), grilled, poached (maiale al latte) and pan-fried. The fattier cuts of pork are good for slow cooking like stewing (maiale ‘briaco), braising (maiale brasato alla Genovese), or making into a meat sauce. Suckling pig (maialino) is normally cooked whole (porchetta, porcheddu). 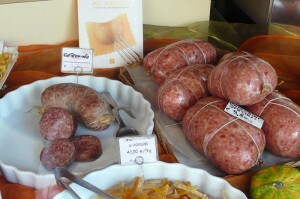 The legs are made into zampone and cotechino (See Sausages). Pork pairs well with chestnuts, potatoes, beans, lentils, and dried beans which absorb the fat and aromatics such as sage, rosemary, myrtle, bay leaves, onion, black pepper, thyme, truffles, and fennel. Good accompaniments include carrots, leeks, cabbage, spinach, peas, and artichokes. Prosciutto can be made from the legs of wild boar (prosciutto di cinghiale), deer (prosciutto di cervo), chamoise (mocetta), goat (prosciutto di capra / violini di Chiavenna), buffalo, goose (prosciutto crudo d’oca), and turkey but typically refers to the hind thigh of a pig. There are two types of prosciutto: proscuitto crudo (cured ham) which is cured or raw and prosciutto cotto (ham) which is baked, steamed, or boiled. To make prosciutto crudo, the pig’s leg is kept refrigerated, then pressed and cleaned, excess fat is moved, it is shaped, then salted for 8 to 18 months (sometimes with seasonings), brushed, cleaned, rested, and then aged. This process requires some skill in order to use an appropriate amount of salt so that the prosciutto is preserved but not so much as to compromise the sweet flavour of the meat. The proscuitto loses 30% of its weight during the process. To make prosciutto cotto, the thigh of a pig is pickled in salt, saltpetre, nitrates, monosodium glutamate, sugar, black pepper, and other seasonings before then being baked, steamed, or boiled. 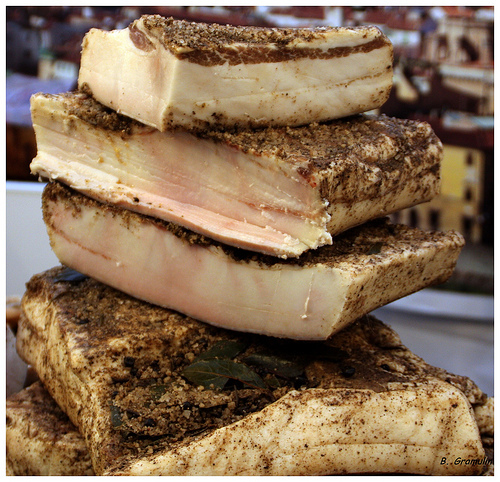 Prosciutto cotto can also be smoked or made from the shoulder of the pig (prosciutto cotto di spalla). Buy: Ideally purchase prosciutto which has been freshly sliced as its texture deteriorates once cut. Another benefit of purchasing freshly sliced prosciutto is that it can be tasted before purchasing. Pre-packaged prosciutto is fine for cooking but for eating raw, it is vastly inferior in texture. 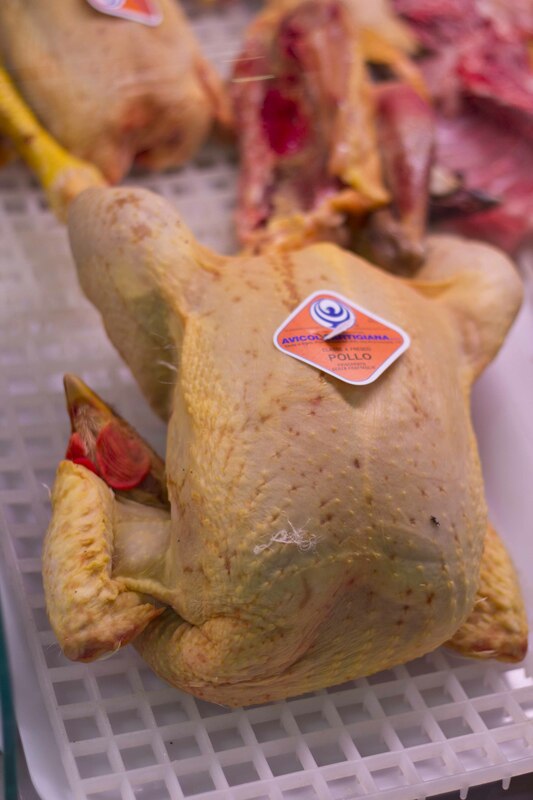 Buying a whole leg requires an industrial meat slicer at home in order to achieve the desired paper-thin slices. 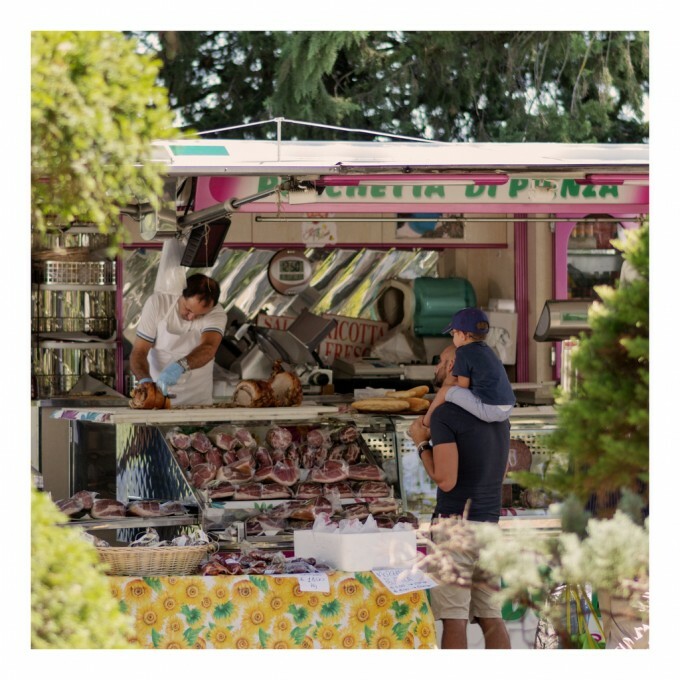 There are many types of prosciutto but two most famous types are prosciutto di Parma (the most well-known and sold abroad) and prosciutto di San Daniele (small production but considered the finest). Prosciutto di Bosses / Jambon de Bosses / Valle d’Aosta jambon de Bosses PDO is a raw ham from Saint-Rheymy-en-Bosses in the Valle d’Aosta and is truly excellent. 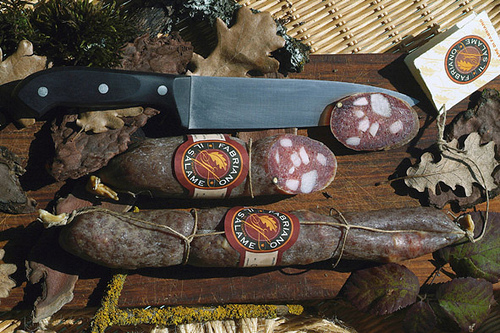 It is dry-cured with sea salt, garlic, sage, rosemary, and local berries and aged for a minimum of 12 months. 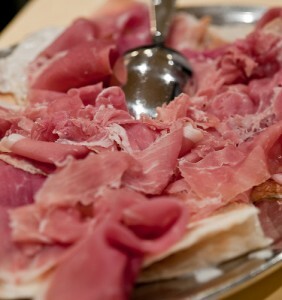 Prosciutto di Carpegna crudo PDO is a ham produced in Carpegna in the Marche. 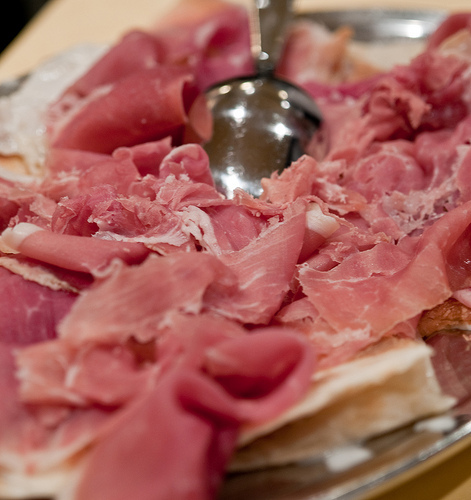 Prosciutto di Norcia PGI is a raw ham produced in the province of Perugia in Umbria. If it is industrially produced, it is cured twice with sea salt and black pepper and aged for a year. 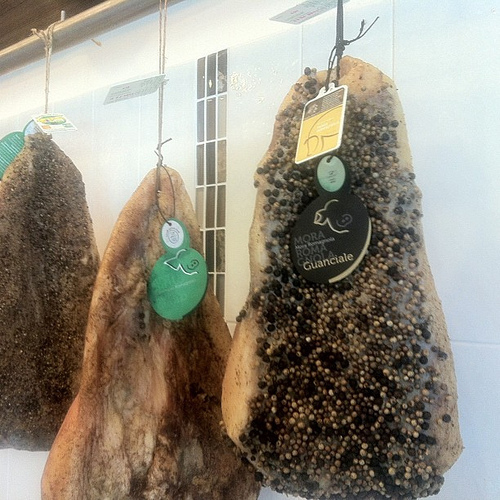 Artisan hams are cured with kitchen salt, washed, rubbed with pepper, hung, lightly smoked, and aged for 22 months. It has an intense and rich flavour. Prosciutto di Parma PDO is a raw ham from Parma in Emilia-Romagna which is made from Large White, Landrace, or Duroc pigs. It is salted, hung dry, and aged for 10 to 12 months. True prosciutto di Parma will carry the seal of the local producers’ consortium which will state, “corona ducale a 5 punte”. 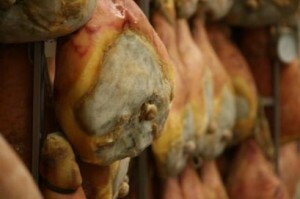 To read how prosciutto di Parma is made, click here. Prosciutto di San Daniele PDO is a raw ham from San Daniele in Friuli-Venezia Giulia. It is cured in salt, massaged, pressed into a guitar shape, and aged in chambers for a minimum of 12 months. It is the finest of all the prosciutto with a delicate, slightly sweet flavour. It should be served raw to preserve its fine texture and taste. Prosciutto di Sauris is a ham from Sauris in Friuli-Venezia Giulia which is salted and smoked for a month over a fire made from local resinous trees. 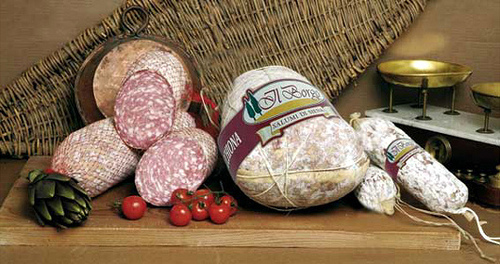 Prosciutto toscano PDO is a raw ham from Toscana. 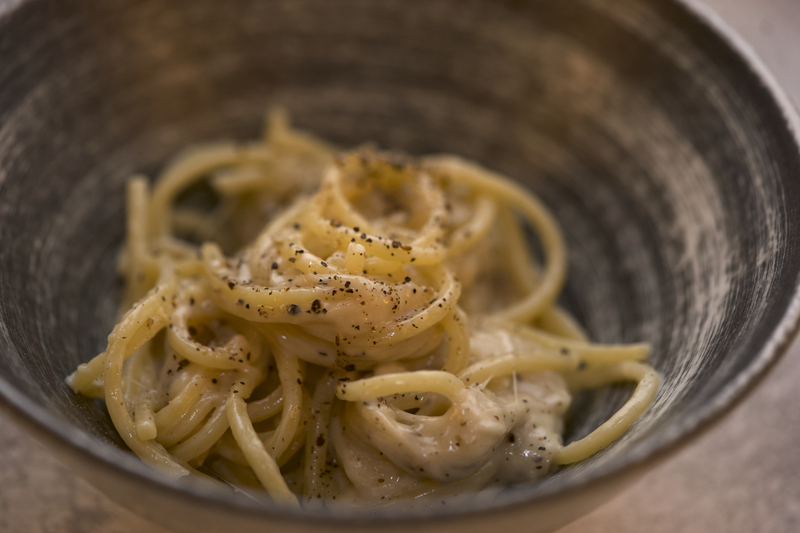 It is cured with salt and pepper, washed and aged for 10 to 12 months. It has a slightly chewier texture and saltier in flavour than the types of prosciutto listed above and while tasty, is considered inferior. 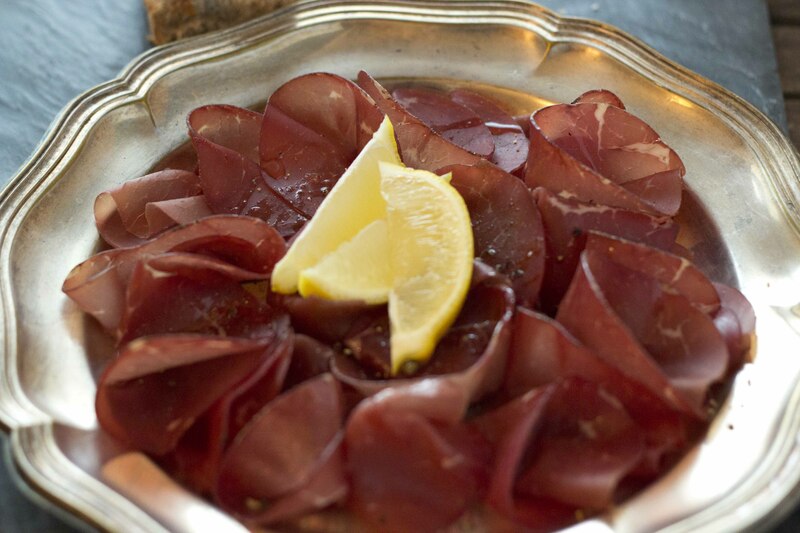 Speck dell’Alto Adige PGI is a cured smoked ham from Trentino Alto Adige. 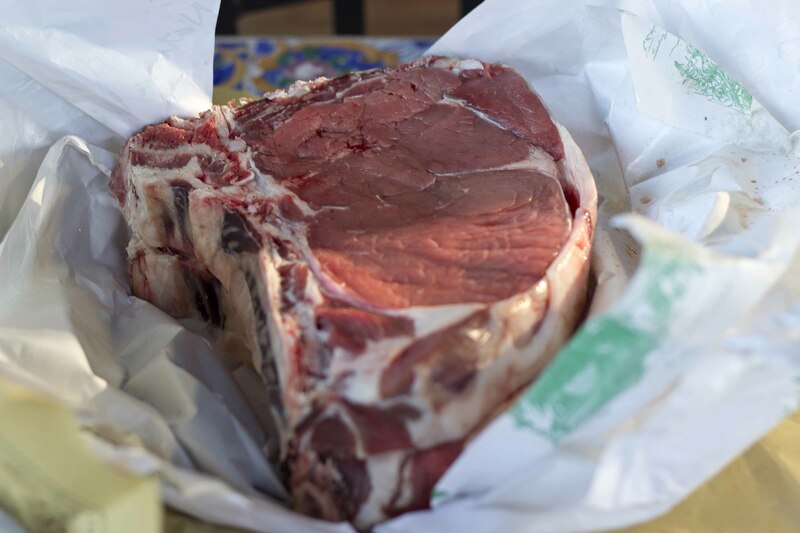 It is dry-brined with salt, pepper, pimento, garlic, juniper berries, and sugar, smoked for two to three weeks and aged for up to 24 days. Store: Prosciutto can be kept in the refrigerator for 3 to 5 days well sealed or frozen for 4 to 6 months. Prepare: If the prosciutto was purchased pre-packaged or freshly sliced, there is no special preparation required. A whole leg or unsliced chunk of prosciutto will require an industrial meat slicer to slice it paper thin. Eat: Prosciutto can be eaten raw on its own or accompanied by other cold cuts, melon, figs, mozzarella cheese, salad, on top of a pizza, and with bread (gnocco, piadina). 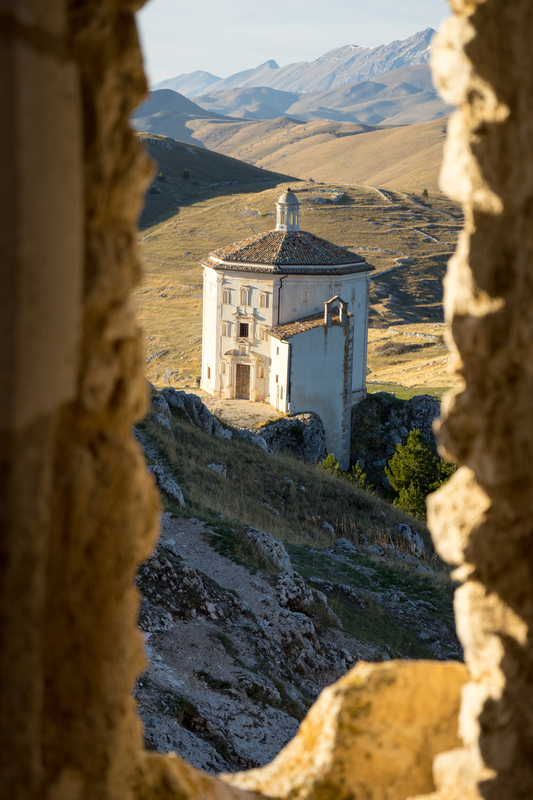 It is also cooked and used in stuffed pasta, to wrap veal (saltimbocca), wrapped around sea bass, stuffings, in sauces, and used to flavour vegetables (piselli al prosciutto). 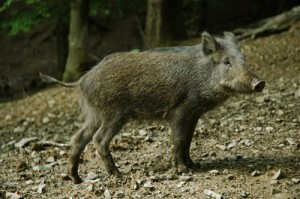 Wild boar is a type of wild pig that roams wild still in northern and central Italy, and Sardegna. 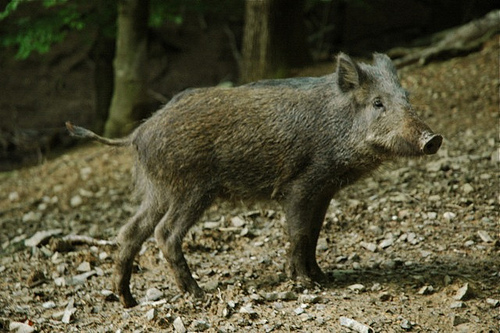 There is also a crossbred between pig and wild boar (meticcio). Wild boar can be wild or semi-wild (live within fenced-in areas). It is particularly prized in Toscana and Lazio. Buy: The ideal age to buy wild boar is under six months of age as it will be juicier and more succulent. 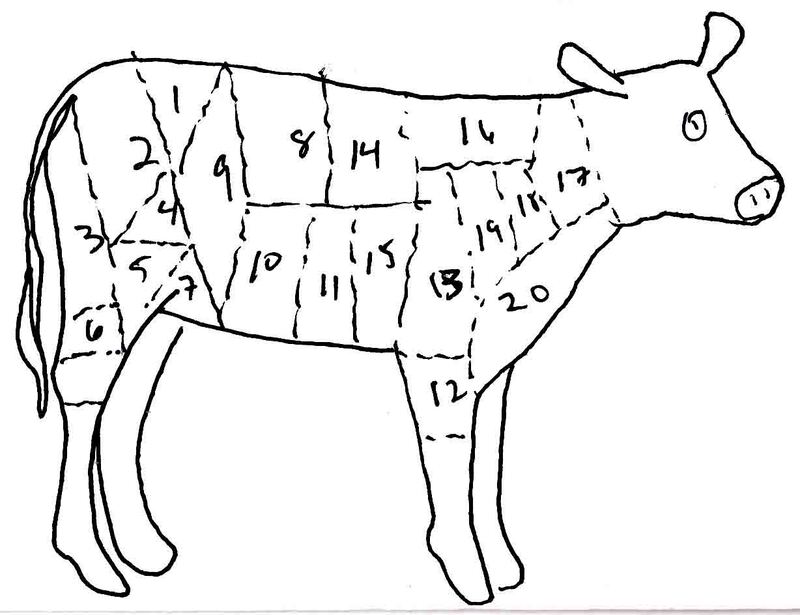 It is best to purchase wild boar displayed with the skin attached so it is easier to ascertain its age. It should be hung for 3 days for cinghialotto and 8 days for adulto after killing. Wild boar is sold fresh or frozen. If purchasing frozen wild boar, then it should only be braised or stewed. 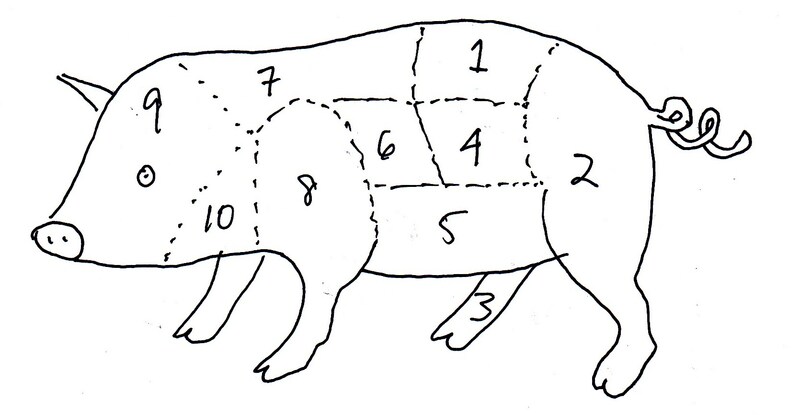 See Pork for cuts. The tongue is also eaten. 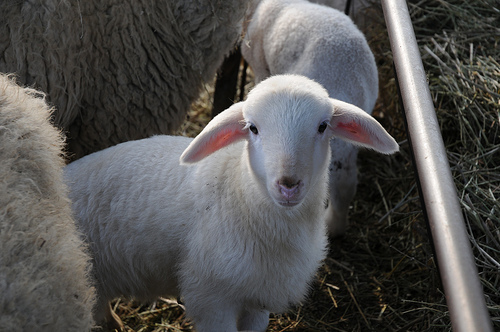 Cinghialotto / Cinghialetto is between three to six months of age and has clear horizontal stripes in the fur. The meat is tender and delicate. 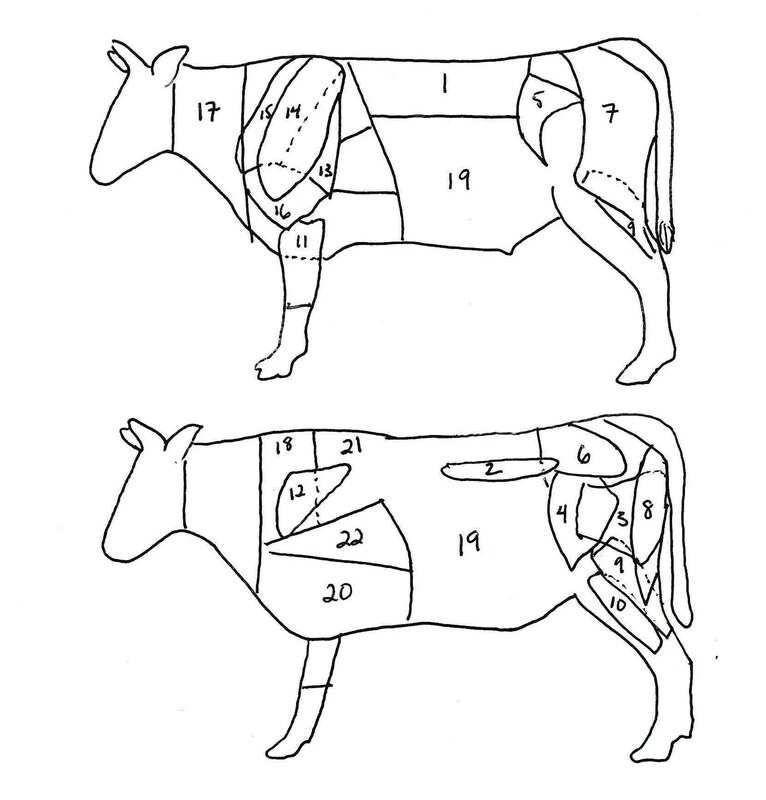 Butchers often leave a layer of fat on after skinning the wild boar. It can be cooked using any method, even roasted. It does not need to be marinated. The upper spare rib, blade, chump and leg can be roasted, grilled or pan-fried. The shoulder and other cuts should be braised or stewed with light seasonings. 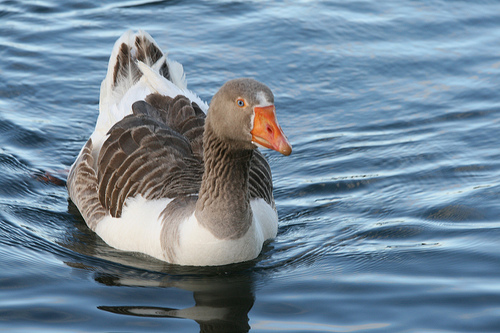 Giovane is between six months to one year old and the fur is tawny coloured. The meat is tender and has a slightly strong flavour. Butchers often leave a layer of fat on after skinning the wild boar. It should be lightly marinated. 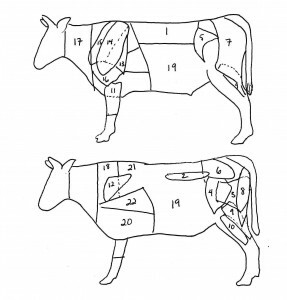 The fillet, upper spare rib and blade can be roasted. The other cuts can be braised or stewed. Maturo is between one and two years old and has darker fur. The meat is excellent and has a gamy but pleasant flavour. It needs to be marinated for a long period of time. The blade (should be sliced), upper rib and fillet can be roasted. The rest of the cuts should be braised or stewed. Adulto is older than two years of age and has almost black fur. It is tough with a strong gamy flavour. If it is less than six years old then it should be marinated for up to 48 hours and then braised, stewed, or stewed in wine (in salmì). Wild boar older than six years of age are unpleasant to eat. 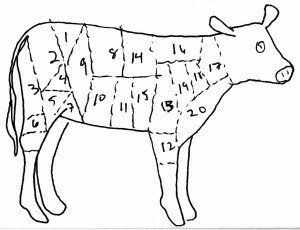 Eat: Wild boar is pan-fried (costolette di cinghialetto), roasted (cosciotto di cinghialetto), braised (cinghiale al civé), spit-roasted (cinghiale all’Aspromonte), stewed (cinghiale alla cacciatora, cinghiale alla maremmana, cinchiale alle erbe, cinghiale in umido, spezzatino di cinghiale) and made into meat sauce to dress pasta (pappardelle al ragù di cinghiale). It is also made into sausages (salsiccia di cinghiale), coppa, prosciutto (prosciutto di cinghiale) or salami (salame di cinghiale). Older wild boar needs to be flavoured with strong aromatics and stewed (cinghiale in agrodolce, scottiglie di cinghiale). It pairs well with fennel, juniper, myrtle, chestnut, blueberries, currants and mushrooms.